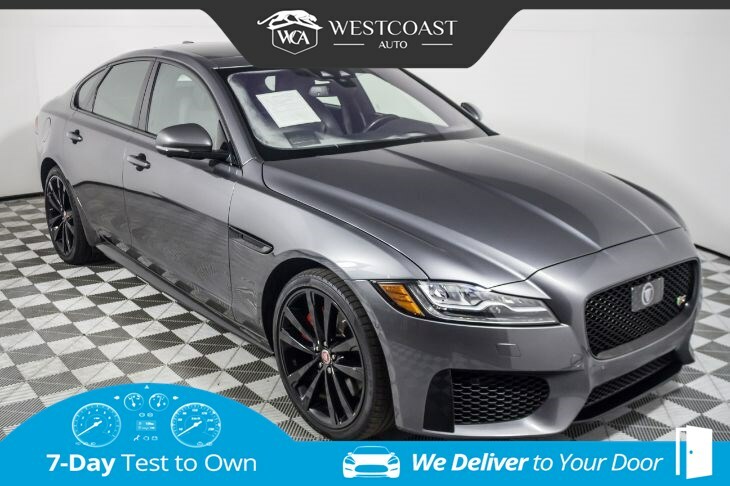 Rekindle your passion for driving with our impeccable One Owner, Clean CarFax 2016 Jaguar XF S brought to you in Grey Metallic. Super Charged 3.0 Liter V6 producing 380hp that is perfectly paired with a responsive 8 Speed Automatic gearbox. Our Rear Wheel Drive sedan soars to 60mph in 5.2 seconds, scores near 28mpg, and provides brilliant handling with its adaptive suspension. The unique stance commands attention with its sleek 20 inch wheels, adaptive LED headlights, red brake calipers, gloss black accents, and a rear spoiler. You'll appreciate the masterfully crafted XF S cabin with a wealth of amenities including keyless entry/ignition, a leather steering wheel, automatic wipers, dual-zone automatic climate control, and an auto-dimming rear view mirror. Relax in the leather seats, take in the ambiance provided by the sunroof, and maintain a connection thank to tech conveniences including a prominent touchscreen, Bluetooth, smartphone app integration, navigation, premium Meridian audio with satellite radio and more! You'll travel safely in this flawless luxury sedan with traction and stability control, anti-lock brakes, airbags, a blind-spot monitor, lane-departure prevention, forward collision mitigation, rear view camera, and parking sensors. It''s time to reward yourself with the art of driving that can only be provided by Jaguar. Print this page and call us Now... We Know You Will Enjoy Your Test Drive Towards Ownership! Great quality, easy financing and affordable prices aren't the only things that make Westcoast Auto Sales the first choice of many discerning auto buyers. Stop in and See California's Dealer of the Year!